Veni, Vidi, Blogi: I Came, I Saw, I Blogged: Peace and Tranquility. 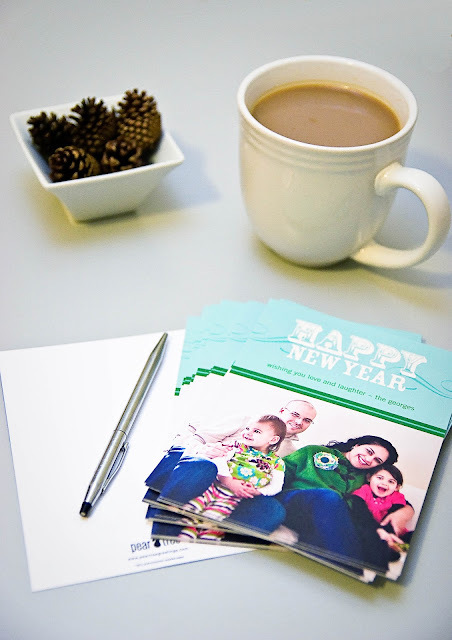 Our New Year's cards arrived late last week, and I have to say that I am so pleased with how they turned out. Thanks again to everyone who weighed in and helped me choose them, they are certainly bright and happy and my life is now complete...except for the fact that I haven't yet mailed any of them. Every time I sit down (with a mug of hot caffeinated beverage and a decorative bowl of cinnamon-scented pine cones to channel my prettiest seasonal penmanship), something insane happens. Right after I took a sip of that beverage, both girls spontaneously erupted into tears. They are basically dealing with the aftereffects no sleep combined with excessive amounts of chocolate ingestion and the euphoria of getting their way for four days in a row. Yousuf and I are calling it the post-Christmas sugar/grandparent detox period of the holiday, and it ain't pretty folks. In fact, it's downright insane. Convincing your kids to not clobber each other with cardboard gift wrap tubes should not be this hard. The only saving grace is that I was smart and got New Year's cards - so even if it takes me 365 days to get them mailed, technically I'm still okay. To my family and friends, don't judge me too harshly if you see one of these appear on your doorstep in July. If you had to deal with the post-holiday crazies you'd completely understand my predicament. Oh, and I just realized that I might qualify for certified geniushood because nowhere on those cards does it mention the year. So if the cardboard-tube negotiating doesn't end well, I could just mail them later....like maybe when the girls are in college? I'm sure nobody will notice the difference in their appearance at all. Aren't the holidays just GRAND?!?!?! Looking Forward, Looking Back (2010 In Review). Orange You Glad You Helped Me Choose? Peace and Love and Latkes. Inara's Rainbow Pre-Order and a HUGE Surprise!